Donning a softly tailored grey jacket, eclectically patterned blue tie and a light layer of mascara, within moments Vladimir projects virile leadership ready to play politics with presidents. Only a few weeks since Putin’s take on military chic was unveiled in the Crimea and shocked the international community, he speaks to Honey Vogue. 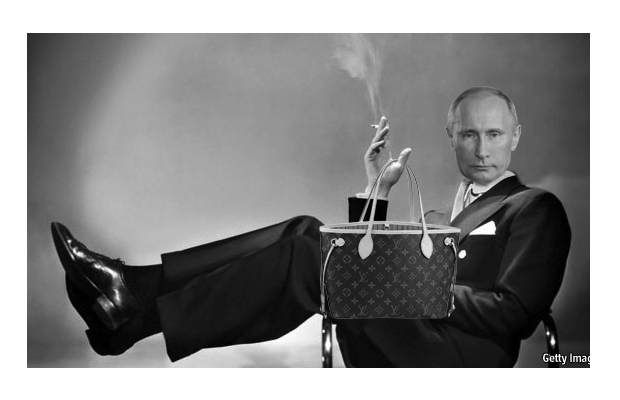 “I was looking for the clean lines and dramatic sweep of Yves Saint Laurent’s approach meets a gypsy-like delight in travel overlaid with costumes of strict warrior tailoring,” Putin says to me as he looks around his atelier in the Kremlin and takes delicate bites at panini flown in that morning from Florence. Accessories-wise, the collection has kept it simple with AN-94 assault rifles, re-imagined with boho-chic bead detailing. Putin’s approach has been heralded as a return to form for his ailing Russian house, and echoes the vision of inspired couturier Josef Stalin. However, the acclaim has not been universal. Veteran Korean designer Ban Ki-moon has stated that sanctions on trade in sequins, satin and chiffon are still not ruled out. Such a move could cripple Putin’s Spring-Summer collection, which is rumoured to revolve around the theme ‘Arabian harem fantasy’. Others are asking whether the Crimea is worth the expensive gamble. Putin assures me that he thinks the peninsular is the investment piece of the season. Nonetheless it is difficult to avoid the conclusion that Putin is the John Galliano of international relations: mad, bad and with unsavoury attitudes to minorities.